Apple has just launched ‘Clip’, the latest TV ad for the iPod Shuffle. To the sounds of Prototypes’ “Who’s Going to Sing?”, the 30 second spot features ten women and men clipping the new iPod shuffle to various parts of their clothing: jeans pocket, shirt pocket, t-shirt neck, hoodie pocket, halter-top seam, scarf, fatigues shirt lapel, jacket and so on. The super: “Put some music on. iPod shuffle”. The Apple iPod Shuffle Clip campaign was developed at TBWA\Chiat\Day, Los Angeles, by worldwide chief creative officer Lee Clow, creative directors Duncan Milner and Eric Grunbaum, art director/assistant creative director Scott Trattner, copywriter Alicia Dotter, agency executive producer Cheryl Childers, agency producer Serena Auroux and account manager Katerina Vardiabasis. Filming was directed by Mark Romanek at Anonymous Content and a team from Brand New School, Anonymous Content executive producer Dave Morrison, producer Aris McGarry and director of photography Jim Fealy. Design, animation and VFX were done at Brand New School under the direction of Jens Gehlhaar and Jonathan Notaro, with executive producers Susye Melega and Jennifer Sofio, art director Rob Feng, producer Nicole Steele, Flame Artist Ryan Yoshimoto, Combustion artists Josh Bolin, Miguel Bautista, Randy Little. Editing was done by Glenn Martin at Nomad, with assistant editors Jim Rodney and Joaquin Machado, producer Devin Brook, and music editors Francois Blaignan and Tom Stamatio. Special effects were tailored at Company 3 by 2D Artists Trix Taylor, Josh Bolin, Miguel Bautista, Randy Little, and colorist Stefan Sonnenfeld. 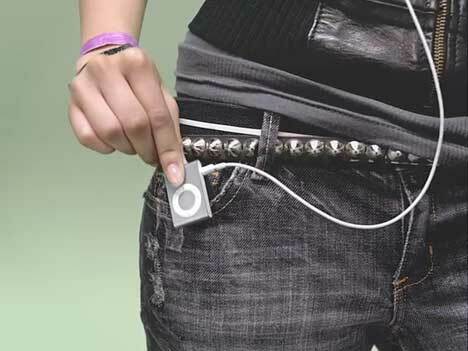 Music for the Apple iPod Shuffle Clip spot was provided by French trio The Prototypes, Stephanie Bodin (bass, synths), Isabelle Le Doussal (vocals) and Francois Marche (guitar). Hear the whole track at The Prototypes MySpace site.